Competition deadline EXTENDED until 23rd Sept 2013! | The Poetry Project – A celebration of Ireland’s literary and visual creativity. Competition deadline EXTENDED until 23rd Sept 2013! We are getting so much quality poetry we have decided to extend , this our final competition, for one more week! The rules are the same all you have to do is write us a poem in response to any one of the videos from the project. The poem doesn’t have to be a literal interpretation, it’s totally up to you! Poems and the tile of the video to info@thepoetryproject.ie by Monday, September 23rd please. 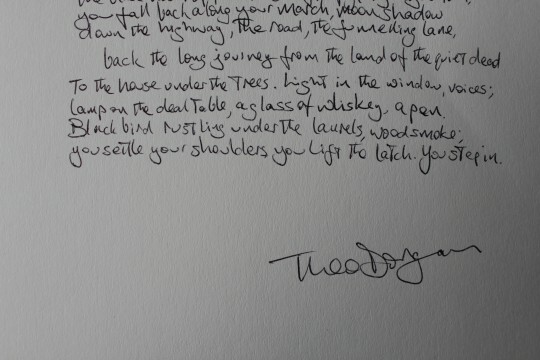 The winning poet will receive a limited edition print from artist Poppy Hunt’s video The Long Lane and a copy of Theo Dorgan’s poem ‘Wild Orchids Wild Flowers’, handwritten by the poet, which was paired with Poppy’s video. The winning poem will be displayed on the Poetry Project website, and will be announced before the end of September.